We’re all big Harry Potter fans in this household so you can imagine our joy when we heard the news about the Studio tours at Leavesden opening up. Christmas at Harry Potter Studios is was our first experience of the tour and we’ve been lucky enough to go a further time as well in the summer. Here’s our trip report and also some tips for if you’re looking to go too. Ok, so the first thing you have to know is that tickets must be booked in advance. You can’t just arrive and hope to get in – they won’t let you. You should also bear in mind when looking to go and visit the Studio is that it can book up and sell out fairly quickly. 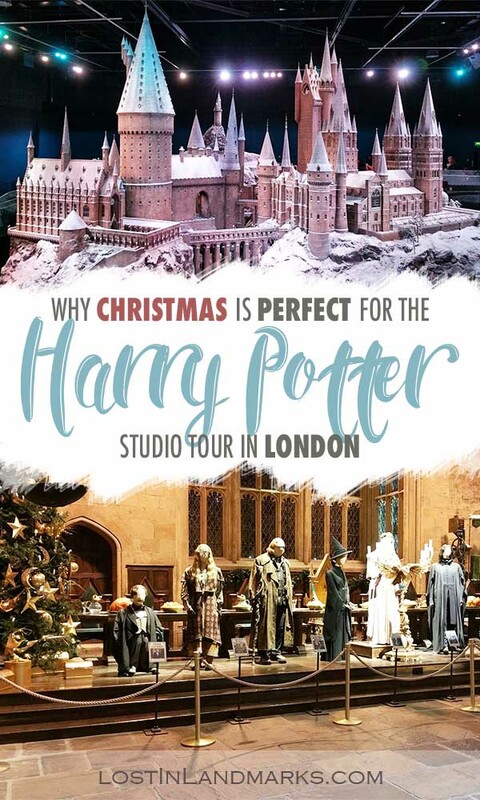 If you’re visiting London or the UK and desperately want to include the studio tour on your itinerary then my first tip would be to definitely book as soon as you can. Weekend dates and dates around school holidays sell out fast so if you’re more flexible then you should hopefully have no problem. When you book you’re given a time slot for entry and when you should arrive. My second tip is to make sure you book an earlier slot if you like to take your time and soak up all the information in the tours. Although there is a set time to enter the studios there’s no limit on how long you can stay once you’re inside and it’s a self guided tour. The tour is said to take around 3-4 hours so even if you get a later ticket you should still have plenty of time. Also take note of where the studio is located – it’s not in central London at all – and take in to consideration the time to get there. It’s possible to book tours with a transfer included which is well worth doing if you don’t want to navigate public transport and if you don’t have your own car. You should aim to arrive at least 20 minutes before the start of your tour time – this is to allow for bags to be checked and for you to pick up your tickets if you need to. The ticket collection points are just outside the studio entrance. Don’t miss the giant wizards chess pieces in the car park too! Arriving early also lets you look around the lobby area which definitely shouldn’t be missed. There’s plenty of film set items on display here that would be a shame to be looked over. You have the flying car, lots of posters showing the cast members and if it’s Christmas you’ll have it all decorated and looking festive too. 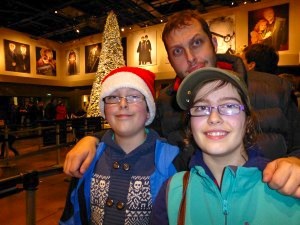 Christmas at Harry Potter Studios – what’s it like? So, speaking of Christmas, what is it like? Is it much different? 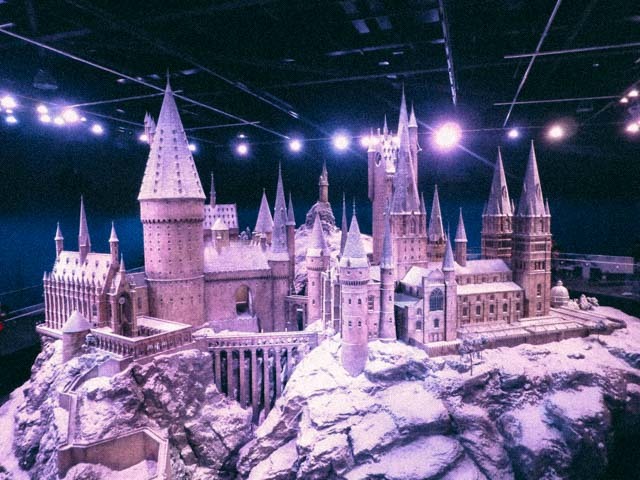 Hogwarts in the Snow, which is the official name of the event, runs from 17th November 2018 – 27th January 2019 this year so no worries about finding time to fit it in the week running up to Christmas! It’s worth noting as well that it’s not actually open on Christmas day or the 26th December as well. We went way back in 2014 at Christmas time and they do add more and more stuff each year – when we went there were lots of festive touches. The Lobby was all decorated and festive and the Great Hall was as well. According to the site it is now decorated as it was in the Goblet of Fire for the Yule ball dance so slightly different to when we went. The tables are loaded up with turkey and Christmas food too! The dormitory and common room sets will also be decorated and one of the nicest bits for me was seeing the big Hogwarts model towards the end of the tour being all covered in snow. In general the tour remains pretty much the same but these events that the studio put on just make it slightly different enough to be special and it certainly helps to feel festive too. 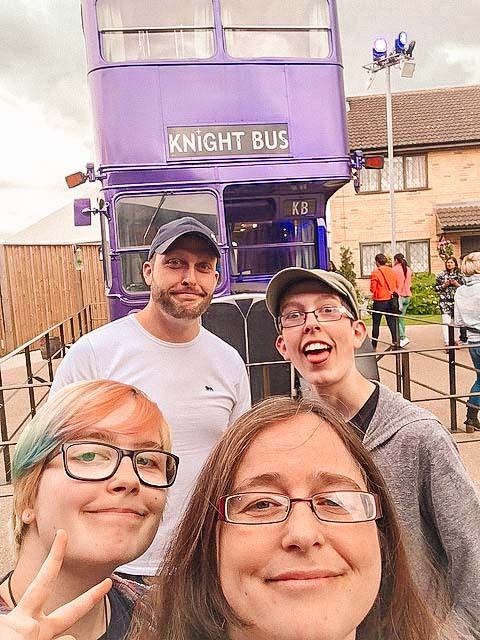 There are many different aspects being added to the tour as well each year – when we originally went there wasn’t the Hogwarts Express at all, but that was added by the time we returned in 2016 and we really enjoyed taking a look at that. 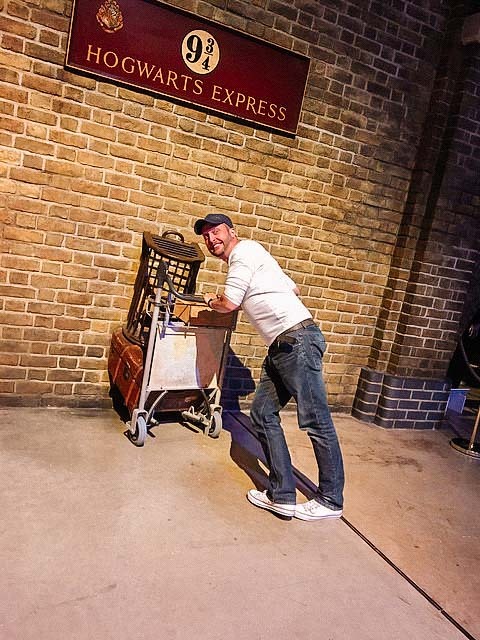 It gave us another attempt at getting through to platform 9 3/4 too! We tried at Kings Cross in London – it was much quieter here! If you’re a big fan of Harry Potter or of film making (or both!) then you’ll really love the tour. It’s really a stunning collection and the way that it’s all set out makes for a really nice day out. There’s plenty of fun things to do as well as just looking at the sets. There’s areas where you can fly a broom stick and there’s an option to buy a photo at the end. I would definitely recommend this – I have never seen a smile quite so big on any of my kids faces doing this! There’s also an area for doing spells although we didn’t have a go at that. At the midway point of the tour there’s a cafe and an eating area and if you’re desperate to try out Butterbeer this is the place to come! I’d heard varying reports so we never tried it – if you have let me know what you think! This is also where you’ll find the Knight Bus, the house at Privet Drive, Godric’s Hollow and also the covered bridge from Hogwarts to explore. This is the only outdoors section with the rest of the tour inside so no worries on weather making it all a bit of a wash out. At the end of the tour is the obligatory gift shop and there’s so much that you can buy there. We could have spent hours looking round! Plenty of ideas for some unique gifts for Harry Potter fans at least! We’ve always travelled by car to the studio tour and it’s always been really easy. Watford is located on the outskirts of London and about 3 miles from the M25 motorway. The car park is free and secure for your tour – you do need to show your booking confirmation when you arrive though. There are many trains from London Euston station which arrive at Watford Junction. Check Trainline if you’re travelling from around the UK and want to see your options. There are a myriad of other ways you could reach the studio – check out the Transport For London’s website’s journey planner for up to date options. I’d definitely recommend getting a combined ticket which offers you transport to the studio as well as your tour ticket if you are staying in London. There are many tour operators available – check out Get Your Guide below which has some different ones listed. The Harry Potter Studios are located in Leavesden which is near Watford on the outskirts of London. Although you can stay in the center of London and get a train to the studios (and if you prefer this option, check out my post about budget accommodation in London), you may find that it is cheaper and easier to have a hotel nearby. The nearest hotel is the Mercure London which is only 1.9 miles away and easy enough to get a taxi from or to walk. You get breakfast included and it’s a really lovely hotel in some gorgeous grounds – doesn’t feel like near London! You can see more here. On a more budget note the Holiday Inn Express in Watford is not too far away and is a great option for families. Rooms can fit up to 4 people and breakfast is also included. You can find more details and current prices here. There is also a Travelodge in Borehamwood which is worth checking out. I like them for their budget prices, but sometimes the fact that you get breakfast included the Holiday Inn Express wins out for us! You can check Travelodge out here. Looks like fun. We had so wanted to do this when we were in London. However we did not realize that we needed to make reservations in advance it was right as school was letting out. Maybe next time…. These are great tips. I just discovered your blog through pintrest and will definitely be following along. I can’t wait to read more posts and put them to use. I didn’t think I needed to visit Harry Potter World, but after reading your post I may have changed my mind! thanks for the comment – it’s definitely a must for Harry Potter fans!